In 2018, Carl Wolf, a marina and boatyard expert with Robson Forensics, published Marina Drownings, Life Rings & Safety Ladders. The book examines his research into people that drowned after unintentionally falling into the water, regulations regarding life rings and safety ladders, and recommendations for best practices. In the late ‘90s, as a marina operator in Ohio, Wolf had a man fall into the water at his marina. He was on-site and was able to jump in with the man, and those at the marina were able to get him out. At the time, the marina had no safety ladders or life rings. “Shortly there after, we had them,” Wolf said. Over his career as an operator and consultant, he had experienced some drownings and noticed that some operators were resistant to safety ladders and life rings because they often weren’t required. Initially, Wolf began researching what guidelines, regulations and standards existed on the use and placement of safety ladders and life rings, which he described in the book as “limited and ambiguous.” He then shifted his research to verify the extent that people were unintentionally fallings into the waters of marinas. “The findings showed that there is an issue of persons not only unintentionally falling into the waters of a marina, but drowning in marinas as well,” Wolf said in the report. 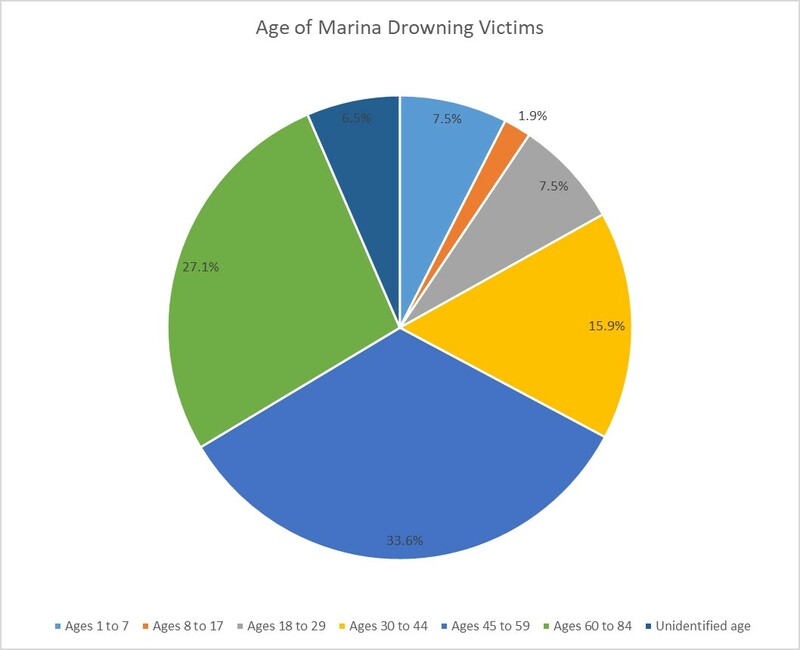 The vast majority of research on marina drownings was conducted through online databases, collected in reports from 2008 to 2017. Wolf’s research identified 107 marina drownings during that time period. Drownings occurred in 34 different states, and 43 percent of drownings occurred in seven states (California, Florida, Georgia, Massachusetts, South Carolina, Texas and Washington). The majority of victims were male (85 percent). Drowning occurred in all 12 months of the year. 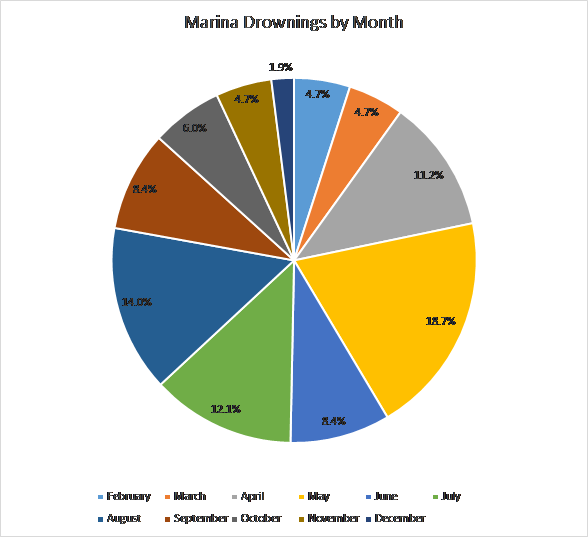 Fifty-three percent of drownings occurred in a four-month period, May through August. Nearly the same amount of victims drowned during the week (48), Monday through Thursday, as the weekend (59). Twelve of the drownings victims were people that lived aboard their boats. Victims fell into the water at marinas in various ways – walking on the docks, embarking or disembarking from boats, working on boats, fell while docking, fell out of the boat elsewhere in the marina, being chased by police, fell out of a chair on dock. Of the drownings, 43 cases were unidentified. “Persons do fall unintentionally into the waters of a marina for a number of reasons; at different times of the day, week and year; at any age; and in various states across the country, both coastal and inland,” the report said. For a large number of cases, how the victims entered the water was unidentified. Also, 37 percent of the time, the time of day was unidentified. Both these statistics, Wolf said, imply that victims were alone when they entered the water. Some standards do exist, but a lack of national or local standards makes education and compliance difficult. 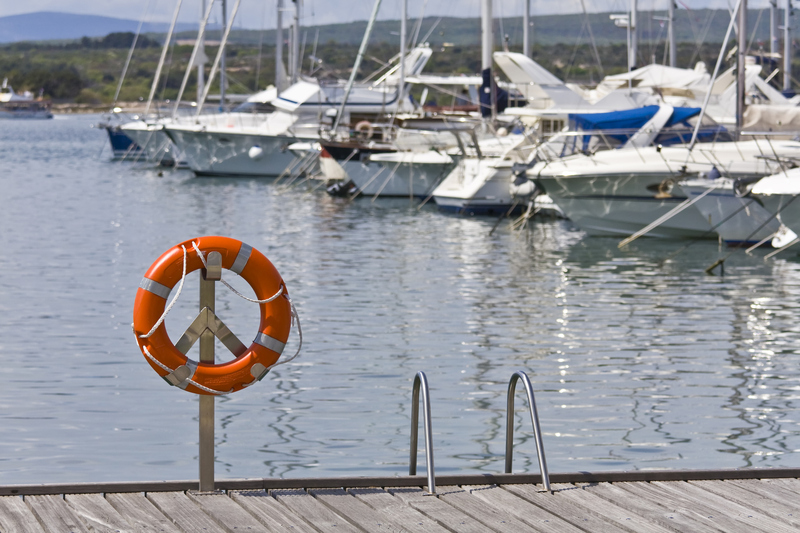 Some of the guidelines that address life rings, even minimally, include the ASCE Planning and Design Guidelines for Small Craft Harbors, U.S. Coast Guide regulations for lifesaving facilities, Guidelines for the Safe Operation and Maintenance of Marinas by the National Water Safety Congress; National Park Service marina standards; PIANC Guidelines for Marina Design and others. For safety ladders, minimal guidelines exist from some of the same sources. Although regulations were limited, Wolf said he liked PIANC’s regulations, regarding the placement of fire extinguishers. He was surprised to see no standards from the U.S. Army Corps of Engineers for marinas operating on Corps property. Through his research and experience at marinas, Wolf developed some recommendations for the book, regarding the use of safety ladders and life rings and the need for a discussion in the marina industry about this safety equipment. Wolf’s recommendations include creating safety centers within the marina, which include a National Fire Protection Association code appropriate fire extinguisher; a safety ladder; and a life ring with a floating line attached. Safety centers should be located within 75 feet of any point on the main docks or at maximum intervals of 150 feet; and at dock/land intersections, where docks extend more than 25 feet. Careful consideration should be given to the distance calculations, Wolf said. Safety ladders may be considerably farther if accessed by water. A safety ladder one side of the dock could be useless to someone in the water on the other side of the dock. Marina safety centers should be identified with placards or signs. “As you look down a dock that might have fire extinguishers, life rings or safety ladders, how easy is it to pick that out?” Wolf asked. “All of that kind of blends in. They blend in with the dockboxes and the color of the boat.” A contrasting color helps pick out the safety centers in a sea of white and blue. Signs should read “For emergency use only;” placed on the dock, facing upward for people on the dock; and positioned toward the water above the upper rails of the safety ladder. This helps identify safety center locations and does not encourage the use of ladders for swimming in the marina. A raised pennant marker and a painted area adjacent to the ladder will help people identify the safety center among boat bow pulpits, power pedestals and dockboxes. When asked what statistics Wolf found the most important, he said, “the children,” referring to the eight drowning victims that were under ages 1 to 7. He acknowledged that it’s hard for marinas to enforce the use of PFDs among marina customers, but operators have a responsibility to educate their boaters and keep an eye out for unattended children as much as possible. Wolf also noted a significant increase in drownings as the years progressed, culminating with one-fifth of the reported drownings in 2017. Because of the nature of his online research, Wolf believes the number reflect an increase in online news sources, as more and more news outlets moved articles and drowning reports online. 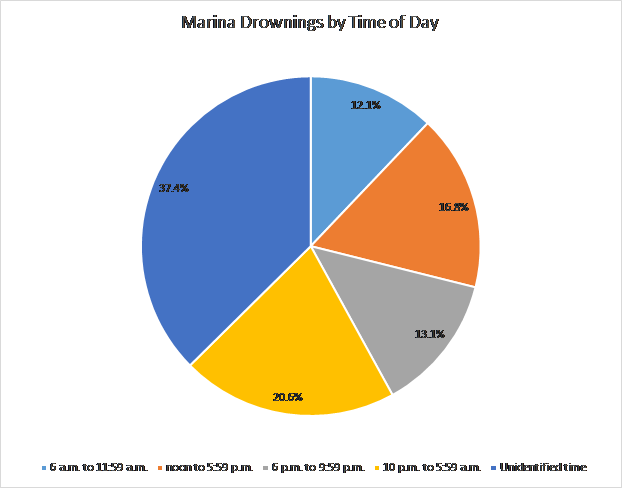 This would mean marina drownings overall may be even more prevalent than the research indicates, as many may not have been reported online early on. Wolf is advocating for a national panel to discuss the issue and propose solutions, a dialogue with marina owners and operators, insurance companies, dock manufacturers, aquatics safety experts and human factors experts. Given the numbers his research recovered and the limited standards, “I think a dialogue should be created,” he said. Wolf believes the use of safety ladders and life rings should be addressed uniformly in the marina industry.